Dedicated to producing quality children’s picture books that tell outstanding stories and which have meaningful ideas as their essence. I recently spoke to Brooke about our ability to change our perspective so that it changes our mood. While my soon-to-be 7 year old seemed to understand, I wasn’t quite sure if the concept was driven home. I was very surprised to find a children’s book that beautifully depicted this theory with very obvious visual queues to which Brooke could relate. 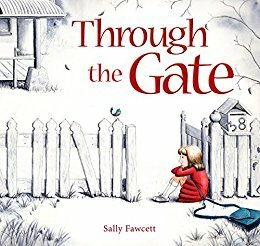 Through the Gate tells the story of a child who has just moved to a house and is struggling to cope with all the changes in her life. She relates to the dilapidated house she has moved to, as she sits sad and forlorn upon its broken front step. But, as the story unfolds, the house is gradually repaired paralleling which coincides how the child’s perception of her new situation improves. Isn’t that a metaphor for life, right? Each time the child passes ‘through the gate’, into the world beyond, she notices more of her surroundings and discovers that her new life has some wonderful things in it. The messages delivered through this story can be understood at literally and metaphorically. Nothing stays the same and difficult times will pass. A little effort in maintenance can improve our physical surroundings, yet our perceptions also color our world. These messages are relevant to both children and adults, as we all experience many changes throughout our lives and draw on our resilience as we adapt to them. The illustrations are a ‘spot the difference’ game that encourages interaction with the story and develops observation skills. Younger children can be involved in spotting the more obvious changes and older children will be challenged with the more subtle transformations. It’s not often that I find such a deep meaning in a children’s book that resonates so much with me and my daughter and it’s a wonderful book to read when we have a day that makes us want to feel better. I LOVE, LOVE, LOVE this book! About the Author/Illustrator: Sally Fawcett is a primary school teacher with a passion for art, creative writing and education. Her three children are a constant source of inspiration for ideas, and have triggered many of her writing and illustrating adventures. Sally’s motivation for creating picture books is to engage adults and children in a shared experience that will hopefully foster a life-long love of reading, creativity and tapping into the power of the imagination.